Put a bike corral, parklet, planter, and street tree on it! Before: Just another parking space in front of Queen City Bicycles in South End on E. Park Ave.
After: Put a parklet and bike corral on it! There's always a need for more public seating and bike racks in South End, especially now that food trucks and gallery openings are no longer a well-kept hot-spot secret, drawing hundreds of folks. Why circle the block multiple times looking for parking when you can roll up on two wheels right next to your destination? Why not extend the sidewalk into more of a patio/front porch style social experience? Put a painted crosswalk, street trees, and spot medians on it! Before: South Boulevard crossing at Rensselaer Ave. Note that the above picture does show an improvement. This "pedestrian island" was installed just a few months ago. Many have noted that the busy South Boulevard acts as a divide for pedestrians between Dilworth and South End. The wide street with fast moving traffic does little to invite a crossing on foot, despite the tasty places like Crispy Crepe and Nova's Bakery, found on opposite sides near this intersection. 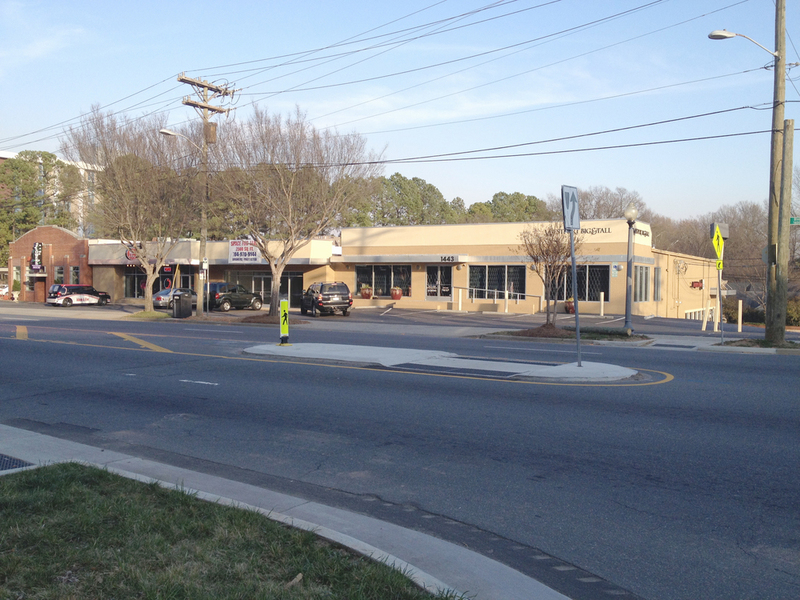 After: Add painted crosswalks, street trees, and spot medians to slow traffic and help pedestrians feel safer. These improvements, seen above, really would be a first step in a series of improvements to dissolve the walking-driving conflict on this corridor. More on-street parking and bike lanes can also be used to make it a more welcoming street to cross.